Upholstery fabric will wear out before the frame. The price of a fabric is seldom an indicator of its ability to wear well. Price is determined by such factors as the cost to manufacture the fibers, the complexity of the weaving process, and the dying process used to add color to the fibers. None of these factors affect the ability of the fabric to withstand normal wear and tear. Modern fabrics can be marvels of technology when they have been selected and designed to sustain wear and facilitate cleaning. Typical upholstered pieces purchased at retail stores do not have the characteristics important for group homes. Many retail fabrics will be damaged by any type of cleaning except for professional dry cleaning whereas contract fabrics allow for cleaning and disinfecting with dilute soap solutions. Always ask for cleaning instructions for your specific fabric choice as cleaning methods other than manufacturers’ recommendations will void the warranty. Crypton and other fluid-barrier fabrics are patented, engineered fabric system with the look and feel of fabric that provides stain, moisture and bacteria resistance, as well as breathable comfort and extreme strength and durability. One solution for incontinence problems. Soil Repellents like Teflon or Scotchgard can be applied either at your site or at the factory. Textiles treated with surface coatings are only effective temporarily. They wear off with use or after laundering, and if done on site, are often unevenly applied. Tuffcloth is a fabric made from Marquesa Lana, an inert manmade fiber that is ideal for use in hard environments. The solution dyed fiber will not fade or react to chemicals or harsh cleaning agents, and is treated with DuPont Teflon to resist staining. It is also resistant to mold, mildew and bacteria. Vinyls of today only vaguely resembles the vinyl of yesterday. No longer just the less expensive alternative to leather, vinyl has morphed from the plastic-like surface that stuck to your skin to a soft, supple line of highly-durable upholstery. Today’s generation of vinyls not only has a new look and feel, it also offers fashion-forward colors, embossments, and patterns. 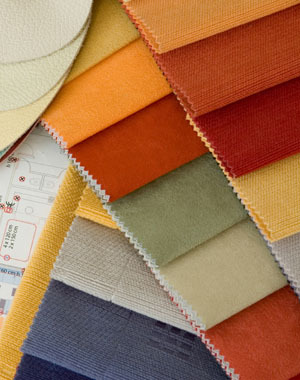 Green Upholstery has become an increasingly viable product line for many fabric mills which has led to a greater variety of available styles, colors and patterns that fit the “green” label. Once a sleepy category, demand for green upholstery has grown as more end-user companies adopt environmentally conscious buying policies.